Even before it happened, it wasn’t hard to predict the kind of comments Rihanna’s new Fenty x Puma show might receive. Unsurprisingly, when we published a news story about the event on Facebook, people riled against the collection. “NO. Just no,” wrote one; “Tasteless,” wrote another. Earlier this month, Kanye West’s Yeezy Season 4 collection received a similar slew of vitriol. It’s interesting how people seem to react so negatively to the idea of a musician staging a fashion show, especially when it wasn’t actually that bad. Because Rihanna’s show wasn’t that bad, and here’s why. To start with, she chose a good location: the very grand Hôtel Salomon de Rothschild just off the Champs-Élysées. Instead of staging it in a park and forcing a rather reluctant fashion press to endure a long bus ride to get there, Rih chose somewhere very sensible. Her reasons for choosing this location weren’t just practical; she wanted to mimic a traditional salon presentation, the type Paris’s fashion houses have been doing for decades. “Tonight it’s going to be a very salon-style show – very French – and that idea was inspired by those old Christian Dior shows from back in the day, when he would show in a small room,” she told Vogue. “When I went to the Dior headquarters and heard the story of how Christian Dior used to show in those small spaces, it stunned me, because Dior is such a huge brand.” Rihanna has spent a lot of time with the fashion elite and it would be ridiculous to think that this hasn’t had an impact on her. With the bills coming out of Puma’s very fat wallet, she could have chosen anywhere to stage the show, and incorporated any number of expensive theatrics – but no, she chose somewhere traditional and, ultimately, very simple. When you look at the collection, it’s easy to see what Rihanna was going for: you’ve got the lace and silk, the bustiers and corsets, the diamonds and pearls borrowed from Marie Antoinette blended with deconstructed hoodies and tracksuits, baseball caps, bucket hats and doo-rags, and chunky-soled trainers drawn from the present day. It was a clever and very zeitgeisty blend of high-end, historical tropes and casual, wearable ones informed by contemporary streetwear. The whole range was perfectly epitomised in the outfit Rihanna herself wore to take her final bow: a blush pink tracksuit-slash-ball-gown paired with a pearl choker. Modern-day royal attire for a modern-day queen. A big part of the collection’s success was just how Rihanna it all felt. “I thought to myself, ‘Just design what you like to wear,’” she said, and it didn’t take a seasoned fashion journalist to see that this was true. Rihanna is celebrated for her style, for her ability to take any garment and make it look cool, contemporary and aspirational – be it a heart-shaped fur cape by Saint Laurent, a canary yellow gown that took 50,000 hours to make, or a hoodie by Vetements and a baseball cap by NASASEASONS. Surely that’s the sign of a genuine style icon – someone who can wear anything, make it look good and make it look them. “Rihanna speaks to her fans with her every look,” said Anna Wintour, before presenting her with the 2014 CFDA Fashion Icon Award. 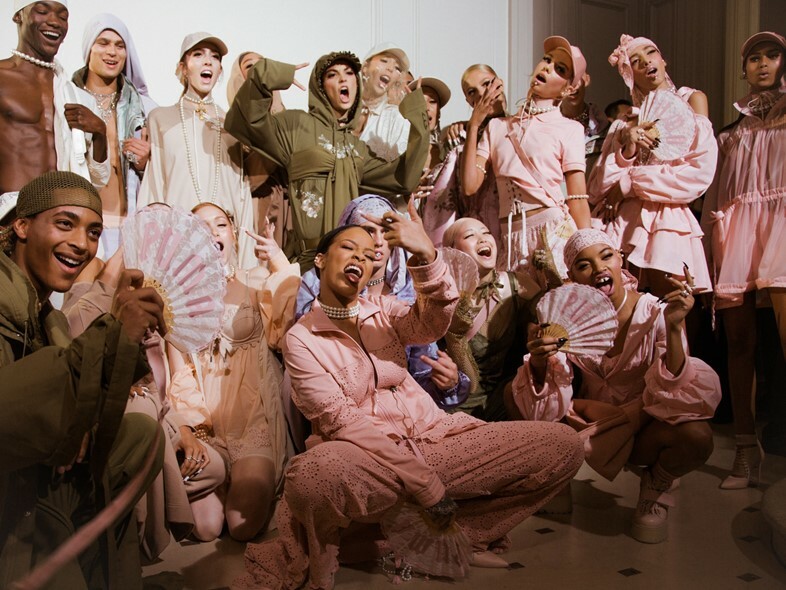 “And what she says to them – and I include all of us in that group – is that it’s fun to feel a little boyish one day and dress up like a dazzling diva the next.” Rihanna and Puma managed to imbue the collection with her style, in all its dualities. Finally, there’s the sheer power of Rihanna’s commerciality. Last year, her $120 Puma trainers sold out online within three hours of its pre-sale launch – a speed at which the majority of brands, however high-end or highly-acclaimed, could only dream of. "I would say demand was bigger than supply," said Puma CEO, Bjørn Gulden, in an interview with WWD, "The launch of the first Puma by Rihanna shoe, the Creeper, has been extremely successful and most retailers have sold out within hours or days.” Whatever you think of her designs, there’s no escaping the fact that they sell. Fashion can be a multitude of things – it can reflect and comment on society, it can be a vehicle for political as well as creative expression, and sometimes it can be just beautiful. At other times, it can be fun – that kind of fashion is no less legitimate. Speaking to Vogue, Rihanna said she hoped people would “receive it in a fun way” and this is definitely part of the collection’s appeal, as well as part of hers. Rih doesn’t take life, or herself too seriously; she doesn’t try and be a perfect, airbrushed icon, she’s the kind of pop star who DGAF – and who you’d like to go on a night out with. She bridges the gap between the highest of high fashion (Dior) and the underground worlds of Hood By Air or Gauntlett Cheng without it feeling inauthentic. “A world of thrills,” is how she described fashion in her CFDA acceptance speech. That’s what last night’s show was – a thrill.